You’ve picked your destination, purchased your holiday essentials and booked your transfers – you’re ready to get away! But, are you flying for the first time? It’s a daunting thought, no matter what your age; What do I need to prepare? How will I know where to go? Will it be busy? Are just some of the questions that will be running through your mind. Don’t panic! 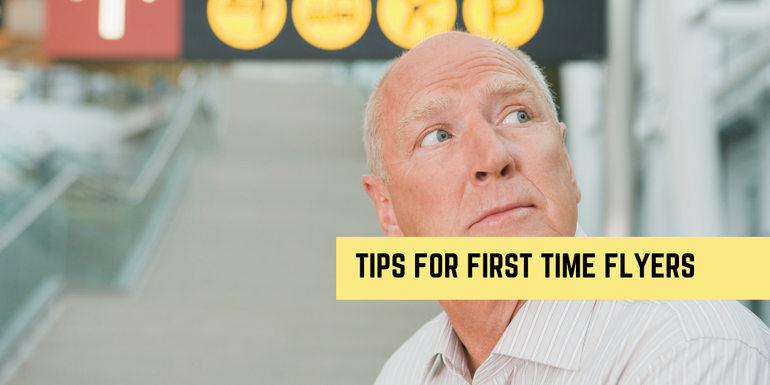 We have put together a few Tips for First Time Flyers to prepare for your first trip to the airport to (hopefully) put you at ease. Research your destination – If you are travelling somewhere exotic, make sure you know whether you need to have any vaccinations or need to have a Visa! Most airlines will allow you to check in before the date you fly – simply follow the steps in your email confirmation to Log In, check your seats, add hold luggage if required and print your Boarding Pass. Note that sometimes you are automatically allocated seats for free! However, if you prefer to pick your seats, there may be a charge for doing so, especially with budget airlines. Top Tip: To make your flight as comfortable as possible, we suggest booking an ‘extra legroom’ seat if you are tall! Before you leave the house, ensure that your Passport, Boarding Pass, Cash or Cards and Mobile Phone are all in your hand luggage! At the time you checked in, you may have had the option to print a paper copy of your boarding pass, or to receive a mobile friendly version (usually a barcode) sent to you. If you opted for the latter, make sure you know where on your phone it is! 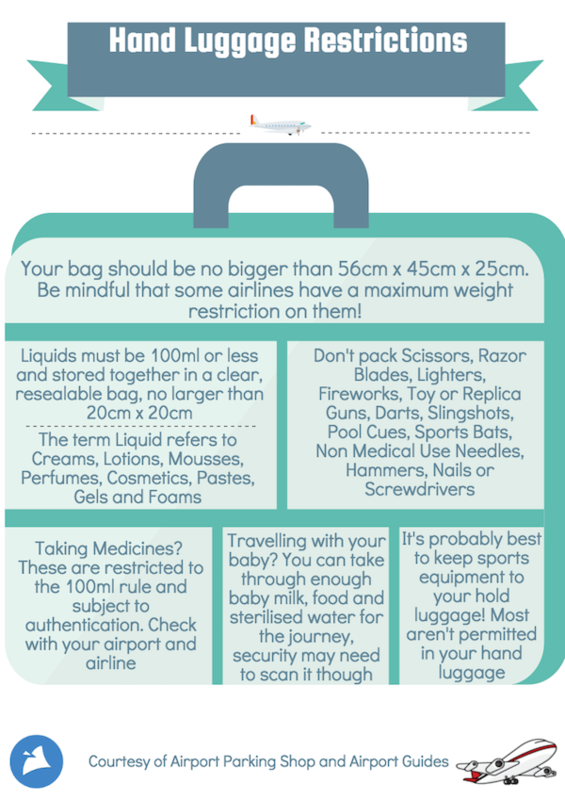 Top Tip: If you are travelling with just hand luggage, check how many pieces you can take; some airlines allow the regular cabin bag, plus a small hand bag / laptop case or duty free bag, others will require that the cabin bag is the only piece allowed, so make sure there is room to put any extras in before boarding! Arrange your transportation well in advance, especially if you need to book transport or hire a car at your destination. If you are driving, be sure to compare the prices of car parking at the airport – again, booking well in advance for the best deals! Top Tip: The day before you travel, be sure to check any traffic reports on major roads – check for closures / diversions and plan accordingly. If you are taking a large suitcase, this needs to be checked in when you get to the airport. Simply head to the check in desk which are usually located near the entrance to the airport. You will see rows of desks, with rows of queues to match, and above each desk they will display the airline and flight information for the flight that is being checked in. Locate yours and join the queue! The attendant will take your luggage and weigh it – as long as it is under the weight allowance, it will then continue its journey to the plane. Top Tip: Always weigh your luggage before leaving home to save any embarrassing unpacking in the check in queue, or having to pay extra because your bag is too heavy! You then need to follow the signs for security, where again, you’ll find more queues! When you get to the conveyor, place your bag, electrical items and any liquids into the trays provided, along with any loose clothing such as scarves and jackets. Be prepared to remove jewellery, shoes and belts too – these may cause the metal detectors to go off and may require an additional body search by security staff. Top Tip: If you have metal plates in your body following an operation, they may set off the detectors. 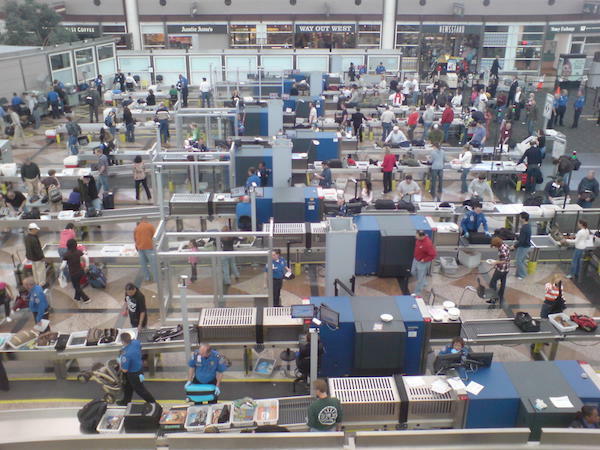 In this instance, you will need a secondary scan with a handheld device – just explain to the security staff – it shouldn’t be an issue! Ah, the world of Duty Free! If you have time to spare (which you should do as you should aim to check in at least 2 hours before an international flight!) make the most of it! In larger airports, you will find a plethora of restaurants, bars and cafes, as well as a large Duty Free Store and the occasional designer outlet. If you’re feeling nervous, sit down for a coffee (or something a little stronger – a Bloody Mary always does it for me in the Airport, not sure why!) and try to relax. You will notice that there are many screens displayed around the departures terminal – these display flight destinations, the flight numbers and when it is opened, the gate number. Gate numbers are usually displayed 20-30 minutes before the gate closes, so keep an eye on those boards in the hour before your flight. Top Tip: Once the gate is open, head straight there – there is no knowing how long it will take you to reach it, and it’s best to be early and wait at the gate than to be that person running through the tunnels desperately trying to reach the gate before it closes! Once at the gate, your passport and boarding pass will be checked and then you will proceed to the plane. Upon boarding, show your boarding pass to the steward greeting you and they will advise where to find your seat. Tuck your documents safely away. Ensure that your hand luggage is either under the seat in front of you or in the overhead storage – the cabin crew will advise where it should be. Take a seat, pop your seatbelt on and relax! Put any electronic devices on Airplane Mode if it has it, or switch off completely. Once everyone is seated, the cabin crew will go through a safety briefing with you, including information on where the exits are and what to do in an emergency – pay close attention to this as first timer! Take off can be a bit scary, so after the safety brief, maybe have something to distract you like a magazine or a talk to your row mate! 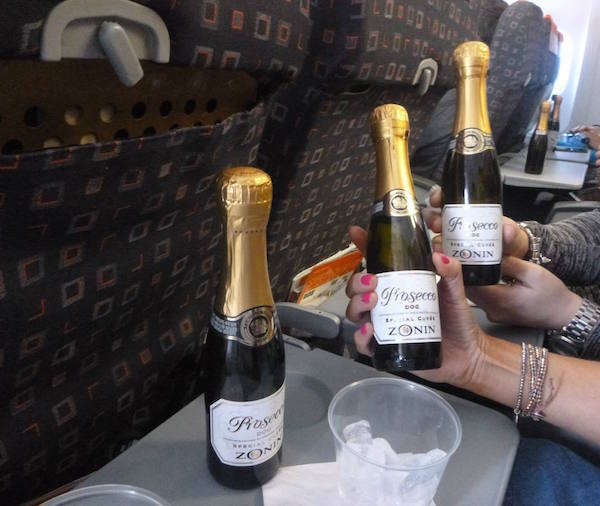 Prosecco on the Plane, anyone? Once in the air, you can order food, drinks and even gifts from the cabin crew, or get some sleep if need be! Don’t be afraid of turbulence (when weather such as strong winds ‘rock’ the aircraft), it’s not dangerous, maybe just keep your seatbelt fastened to make you feel more secure. Top Tip: The change in altitude on take off may cause your ears to pop, which can be painful. If you’re worried about this, purchase some boiled sweets or mints from the shops after security and have a couple while the plane takes off! Everyone will depart the plane and make their way to arrivals – this should be sign posted, but you generally just follow the throng of other passengers! Follow this all the way to customs where you will need to present your passport once again to the officials. Once you are through, follow the signs to baggage reclaim to collect your bags if you checked any or just proceed to the exit! 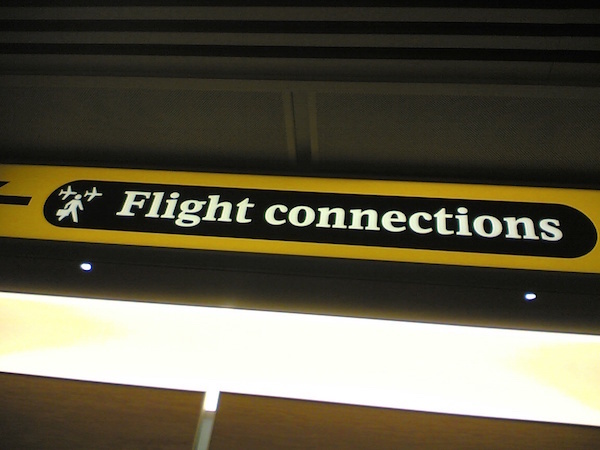 Note – If you are connecting straight onto another flight, you probably won’t need to go through customs; just follow the signs for ‘flight connections’ and join the appropriate queues for your next flight. Top Tip: To really feel at ease prior to your journey, research the airports you will be travelling through. Get to know what facilities it has, where the information points are and where you can get a taxi from for example. You can then head over to @TravelPains to vent about it with us! I’m glad you found the blog useful, albeit a little late! I will be going from Atlanta, USA to Delhi in December via Heathrow Airport London by Virgin Atlantic. I have nearly 10-11 hours layover on way to Delhi and about 14-15 hours layover on my return. I cannot afford hotel at the Heathrow airport? Can I stay safely at the airport?? I will go thru the Terminal 3. People do sometimes opt to sleep in the airport, but you’ll need a back up plan in case you are asked to move on. You can book into a hotel for as little as £44 for the night – The Ibis hotel is currently offering rooms for this rate. Great blog.I will be visiting El salvador next month from Kenya.I am a first time flyer.I find your blog very much informative.What other things should I expect on my way? Glad you found it useful, Arnold! May I suggest you have a read of our blog on how to manage a long haul flight and maybe even our one on how to beat jet lag – you may find both pretty useful to make the most of your trip. Enjoy your time in El Salvador! I will be traveling from Antigua & Barbuda to London ( Gatwick Airport )where I will be layedover for a few hours until my connecting flight to Moscow (Domodedovo airport ). This will be my very first time traveling and I will be all alone. To be honest I’m terrified because I’m afraid I’ll miss something important or not know where to go or what I should do. Any tips known for my personal trAvel would be appreciated. I fly with British airways . No need to be scared, there will be plenty of airport personnel on the ground to answer any questions you have when you land at Gatwick. When you get off the aircraft, there will be sign posts for where you need to go for connecting flights. Also, you flight booking documents may even tell you details of what you need to do.